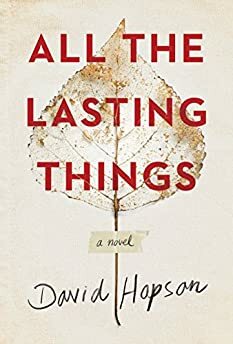 Largehearted Boy: Book Notes - David Hopson "All the Lasting Things"
Book Notes - David Hopson "All the Lasting Things"
David Hopson's debut novel All the Lasting Things is a poignant portrait of a memorably dysfunctional family. "In his richly textured and utterly convincing portrait of the beleaguered Fisher family, David Hopson delivers a novel of rare intensity, intelligence, and emotion. All The Lasting Things explores with great skill and honesty the genuine human need for relevancy, for recognition, for remembrance." I don't listen to nearly as much music as I'd like. I can't have it on when I write. Or read. Even at dinner parties: a good song can easily leave me wondering what the person next to me has been saying for the last three minutes. No, music is the art hanging on the wall; it's never the wallpaper. But I can only go so long without it. There are moments when the writing, the reading, the dinner companions have to be set aside for a night with The National or Nina Simone. I could say these moments are like a vacation, but vacations imply an escape from work, while my musical excursions feel more like a road that leads deeper in. I needed many such moments while writing my novel, All the Lasting Things. Music was my first point of contact with my main character, Benji Fisher, a debased actor whose star, which rose long ago when he was a child in an 80s sitcom called "Prodigy," no longer burns as bright. Music was also essential to helping me shape Max Davis, a twentysomething cello virtuoso and real-life prodigy, whose sudden appearance upends Benji and the entire Fisher clan. More than any other, this song brought the novel into focus. Every time I listened to it, which I did with a kind of adolescent obsessiveness, I saw Benji a little more clearly. Hole's entire third album plays like a siren's song, but it's the title track in particular that charts the journey of fame-seekers who find their dreams of celebrity dashed far more often than they find their coveted spotlight. We spend most of the novel wondering whether Benji will set off on such a trek, whether he'll sacrifice a life well lived for a life well watched. When I hear Courtney Love's gravely wail—"Oh, look at my face / My name is might have been / My name is Never Was / My name's Forgotten"—I hear the fear that seizes Benji's soul, his unshakeable desire to break free of obscurity and do whatever it takes to be remembered. Benji is a big Wilco fan. He plays A Ghost is Born so often that his girlfriend, Cat, who does more than anyone to steer Benji towards a life that's more substance than sparkle, is sickened by it. "Theologians" is the standout song for me because it wryly insists that each of us is a mystery, unknown to those who should know us most, unknown even to ourselves. Benji begins the novel playing the ghost of King Hamlet in a sad little regional rep. He ends as a ghost of another kind. I recognize his predicament in the lines "No one's ever gonna take my life from me / I lay it down / A ghost is born… / A cherry ghost." What is a "cherry ghost"? Beats me. But I love the fact that the band's front man admits that he has no idea either. Again, the mystery. I've always been a classical music fan, though I feel totally unqualified to talk about it. For me, it's like trying to declare my love in Latvian, and I don't speak Latvian. That said, I listened to a lot of it while writing this book in hopes of better understanding Max. "Spiegle im Spiegel" reflects something of the abiding sadness of the Fisher's story. It is most often orchestrated for piano and violin, but I prefer the recording that features cellist Dietmar Schwalke: a mellower, more resonant take on one of the most introspective, hypnotic, and beautiful pieces of music I've ever heard. Another plaintive piece of incredible emotional depth. I imagine Max, whose short life has been marred by his struggle with manic-depression, playing it towards the end of the novel as he braces himself against a tide of mania that threatens to carry him away. He searches for ballast in this haunting, heartbreaking work. I can hear his vulnerability in it. A lovely song of loss and longing. Only Antony Hegarty and his inimitable voice could get so much mileage from six simple words: "Paddy's gone/For a long time." The shape of Max's character was sharpened by my reading of Rebecca Mead's excellent profile of Nico Muhley in The New Yorker. In Muhley, I saw something of my boy genius. The end of this piece is especially evocative: in it, I hear a curtain falling heavily on a play that hasn't quite finished. Benji is, at times, a hard guy to like. He tends to make terrible decisions that ripple, sometimes disastrously, into the lives of those he loves. He's aware of this, but also unable to stop: try as he might, he simply can't get out of his own way. When I listen to this song, I hear Benji's failure, but I also recognize his desire to do better, to be better. For me, the National offers a deep well to draw from. I go back to this band again and again, and I can never quite shake this song. There's something here that connected me to Max's desperate battle against his illness, to the disappearance of his "rosy self" and the bargain that must be made with "the side effects that save us": "I'm trying, but I'm gone / Through the glass again / Just come and find me." Benji's journey has always ended with this song. It perfectly describes where he is: on a plane feeling "the emptiest of feelings," "crushed like a bug in the ground," and yet there remains the possibility of a metamorphosis: "Floor collapsing, floating / Bouncing back and / One day, I am going to grow wings."